Ariella Azoulay is Professor of Modern Culture and Media and Comparative Literature at Brown University, a documentary film director and an independent curator of archives and exhibitions. 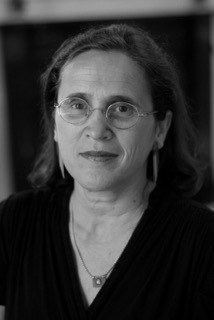 Her books include: From Palestine to Israel: A Photographic Record of Destruction and State Formation, 1947-1950, (Pluto Press, 2011), Civil Imagination: The Political Ontology of Photography (Verso, 2012) and The Civil Contract of Photography (Zone Books, 2008); co-author with Adi Ophir of The One-State Condition: Occupation and Democracy in Israel/Palestine (Stanford University Press, 2012). She directed the following films: Civil Alliances, Palestine, 47-48 (2012), I Also Dwell Among Your Own People: Conversations with Azmi Bishara (2004). The Boycott, Divestment, and Sanctions (BDS) movement is a way to achieve three things: (1) to expose the mechanisms of dispossession, segregation, and legalized discrimination against Palestinians that are part of the Israeli democratic regime; (2) to publicly and internationally express solidarity with the Palestinians as a people, confronting the Israeli regime’s continuous efforts to fragment them into groups that are governed differentially within and beyond the green line; and (3) to mount pressure capable of impacting daily life for the privileged group of the governed population, i.e., Jewish Israelis, in order to radically alter the conduct of the Israeli regime or transform it altogether. A call for boycott is based on the assumption that sovereign states are actors in an international arena, and hence individuals, groups, institutions, and states can suspend their interactions with particular regimes until the justice of certain demands are recognized and adequately addressed. The Palestinian-led BDS movement thus aims to mobilize the international community to respond to a triple call from within that advocates: full equality for Palestinian citizens of Israel, an end to the military occupation of the Palestinian territories, and the right of Palestinians who were expelled in 1948 to return to their homes. The boycott targets the Israeli regime, not Israeli citizens, unless they act as representatives of the regime. What, then, is the position of Jewish Israeli citizens with regard to this call? They may not be able to suspend their relations with the state completely, as BDS leaders themselves acknowledge. However, they can narrow them down. Occasionally, when they are able to mobilize certain symbolic power, they can publicly boycott particular events, prizes, and ceremonies, and avoid giving services that they are required to give. In this sense, their responses to the crimes and abuses practiced by their own regime do not come from an external position and hence do not consist of solidarity of the sort offered by citizens of other countries. Jewish Israelis are governed alongside Palestinians, and they are subjects of the same political regime; their citizenship is not external or incidental to the abuses of Palestinians under this regime, but its constitutive element. Unable to endorse the boycott from the outside, Jewish Israelis can still take part in it, and their participation, as citizens denouncing their own political regime, makes the BDS movement’s call a call to redefine the nature of their citizenship altogether. Under the emergency regulations that have not been revoked since 1948, and whose purpose has been to maintain the principle of differential ruling, to be a good citizen means being involved, in more or less direct ways, more or less enthusiastically, in exercising the violence necessary to maintain this principle. Therefore, from the point of view of an Israeli citizen, the call for boycott can also be the beginning of the recognition of a right that Israeli Jews have been consistently deprived: the right not to be perpetrators. The crimes that justify the boycott of Israel, crimes perpetrated against the Palestinians, are not just crimes against Palestinians but, to use Hannah Arendt’s expression, crimes against humanity. Stopping crimes against humanity should not remain the interest of Palestinians alone. These should be, first and foremost, the obligations and interests of Israeli Jews and the Jewish community worldwide, of all those who were implicated in committing and perpetuating these crimes, all those who—by collaborating with the political regimes that have ordered the crimes, refused to acknowledge them, and spread misinformation about them—have been deprived of their inalienable right not to be perpetrators. In a decades-long process, the Israeli regime has succeeded in making it almost impossible either to imagine civil life in Israel-Palestine or to recognize the common history of Jews and Palestinians as a point of departure for any process of Palestinian reparation. The engaging call of the BDS movement—“Let us harness solidarity into forms of action that can end international support for Israel’s crimes”—should be understood as addressed to the international community. Israelis cannot allow themselves the luxury of solidarity, as if the struggle to overthrow the Israeli regime and the history of almost seven decades of regime-made disaster is a Palestinian cause they support from the outside. Israeli Jews should engage in the BDS movement’s call, but they should also do much more. It is their duty to start imagining new forms of partnership devoid of any claim for Jewish supremacy.